Vancouver Supports Indigenous Human Rights!! On April 6th, we have an amazing opportunity to show the Government that Canadians truly want reconciliation. Bill C-262 will ensure that the Declaration on the Rights of Indigenous Peoples is respected in Canadian law. But the timing is urgent - we need to get 262 through the Senate soon. Grab your friends and come show your support! Saturday at 1pm at the CBC building downtown (800 Hamilton Street). Join Indigenous People’s Choice award winner Cheryl Bear and others, as we rally support for Indigenous Human Rights. This event is InterFaith and will include representatives from many faith traditions who will explain their commitment to this Bill. Background: The Truth and Reconciliation Commission has called Canada to adopt and implement the UN Declaration on the Rights of Indigenous Peoples as “the framework for reconciliation” (Call to Action #43). Bill C-262 will ensure that Canada's laws are in harmony with the Declaration. But we need your help! 262 is in the Senate and it needs to get through committee and to 3rd vote in the next few months or it will not achieve royal assent. Please come out, and show your support for Bill C-262! Stay up to date on details and let us know you are coming here. Join us for a walk through history. The Blanket Exercise is a teaching tool to share the historic and contemporary relationship between Indigenous and non-Indigenous peoples in Canada. For more info watch this. 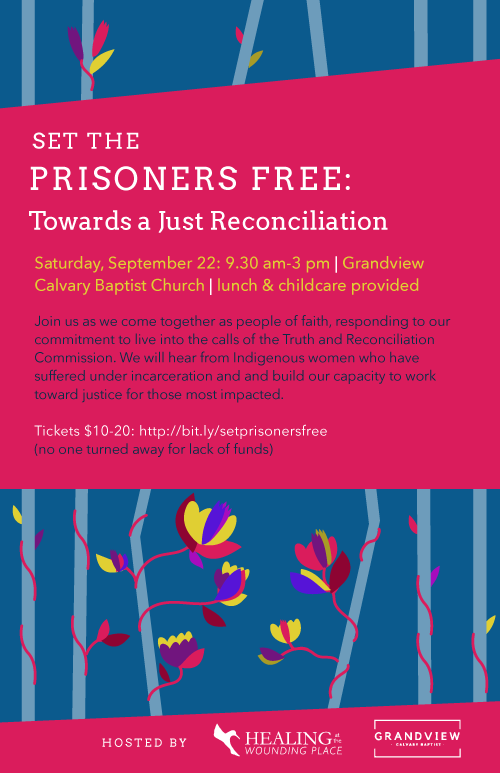 Join us to explore next steps on the path to healing and justice in the relationship between churches and First Nations. Explore ways to get involved locally in these efforts. Consider the role of the church in this journey. Join us in Edmonton for a week focussing on Justice for Women as a path for reconciliation. 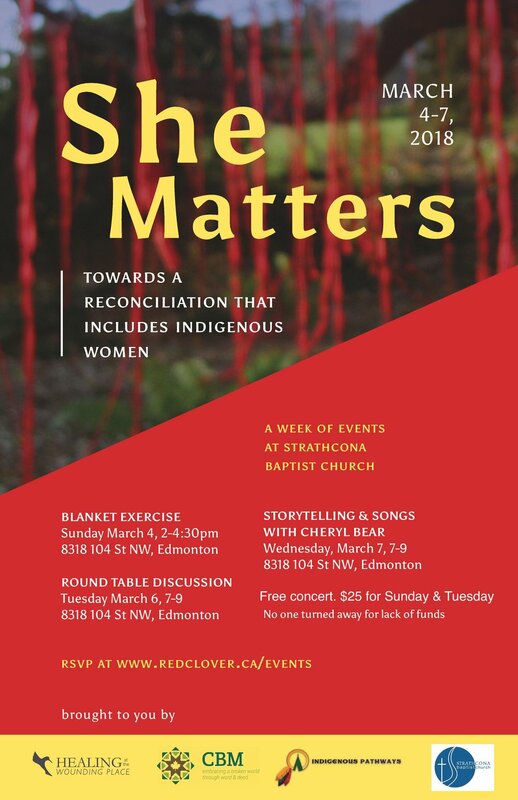 She Matters Canada concert with story-teller and singer-songwriter Cheryl Bear . Thank you for registering! We look forward to seeing you. Come participate outside at Crab Park by the ports. This is an Artisan Church sponsored event. They will have hot dogs on the BBQ for anyone who comes early to eat first. Join us at Soma for the first of two evening workshops. The workshop will be an introduction to several issues around restoring right relationship between the church and first peoples of Canada. This will be an evening that will allow all to listen and to ask questions without fear. Please register for this workshop here—space is limited.